Audi plans to make just 44 units worldwide of which of which five will head to the UK in right hand drive form. 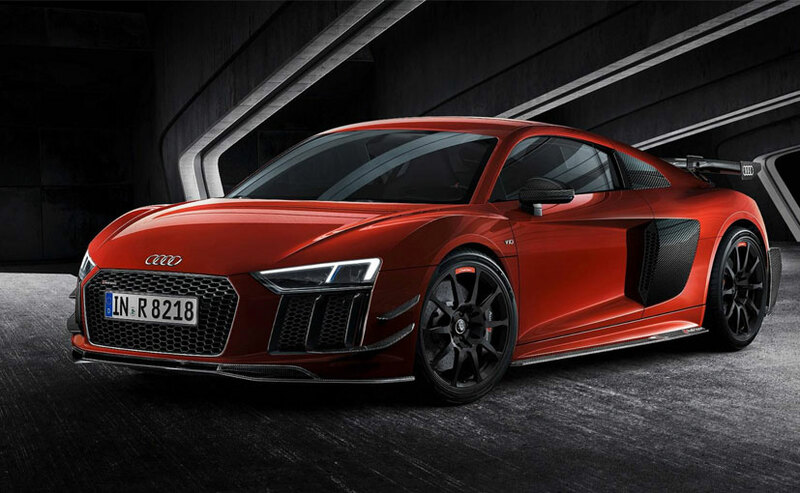 There's a special Audi Sport Performance Parts version of the R8 that has been announced by the company. 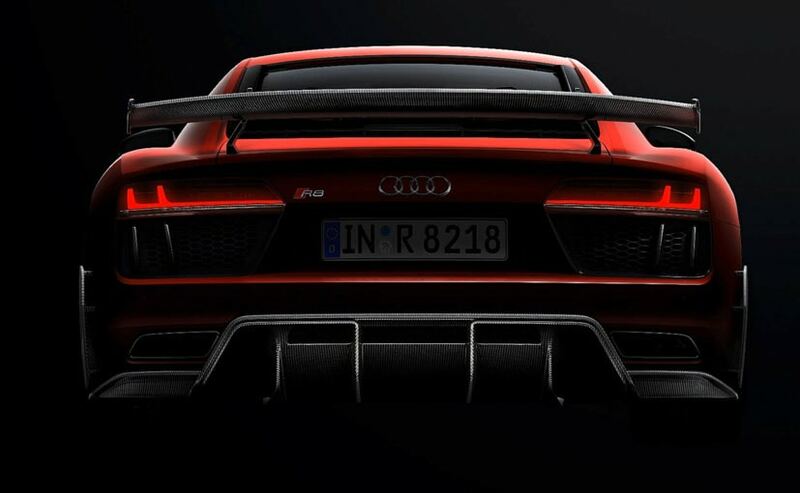 In the new Audi Sport Performance Parts R8 there's been a significant update in terms of performance and it isn't purely a function of power output but, will be delivered to dramatic effect through motorsport-proven enhancements that significantly increase downforce and further pare back weight to give the 602 bhp V10 an even freer rein. The company plans to make just 44 units worldwide of which of which five will head to the UK in right hand drive form. The R8 V10 now gets a multitude of add-on components which mark it up as a performance version. It gets an aero kit developed in the wind tunnel and made exclusively from CFRP gives a harder edge to virtually every facet of the car, most notably the rear where a large fixed rear wing and diffuser with red elements dominate, while side skirts incorporating the Audi Sport logo and special aerodynamic elements located behind the rear wheel arches focus airflow. 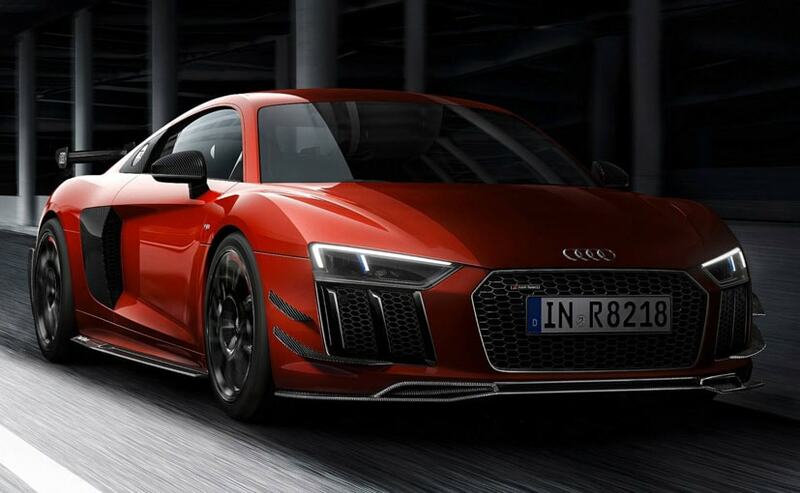 At the front are more pronounced air inlets, a deep splitter and sculpted canards reminiscent of those fitted to the first generation Audi R8 GT finish off the package. All aerodynamic elements contribute to a significant increase in downforce; at 330 kmph, the R8 generates 250kg, over 100kg more than the standard R8 V10 plus. At 150 kmph the effect is more pronounced, with the CFRP aero kit doubling downforce to 52kg. The multi-spoke black 20-inch wheels save up to 8kg in weight to significantly reduce unsprung mass. They are shod with Michelin Pilot Sport Cup 2 tyres with a 245/30 profile upfront and 305/30 profile at the rear. A lightweight three-way coilover suspension setup is also fitted for full adjustability on road and track. Ceramic brake discs fitted to the front and rear feature a titanium backing plate to further reduce vehicle weight and work with specially enhanced brake pads for highly effective stopping power and even tougher fade resistance. Inside, the exclusive Sport contour steering wheel is trimmed in Alcantara with a red 12 o'clock marker. Features such as the Audi Smartphone Interface, a rear view camera and the Audi R8 sport exhaust are also added to the appropriately lengthy equipment list which already includes R8 bucket seats in perforated Fine Nappa leather, MMI Navigation, Audi connect online services and the fully digital Audi Virtual Cockpit.